Keith Olbermann wants a piece of the extraordinary 2016 campaign. In an interview Wednesday on "The Bill Simmons Podcast," Olbermann repeated his recent pledge to "come out of retirement." He also dropped a hint on where he may land. Saying there has been a "sea change" in news media, Olbermann indicated that a traditional organization might not be the best fit. "Whereas I've been talking to these original, kind of mainstream, old guard, OG kind of outlets," he said, "I don't know if it's the right place to go." Still, he suggested he would like his own show once again. He said he wants to make his "opinions known on a regular, perhaps hourly basis somewhere." Olbermann said he's "been in talks with people about going back into political television" for the last two years. He left ESPN almost nine months ago at the end of his contract after hosting a nightly program there since 2013. The New York Post reported earlier this month that Olbermann's representatives had discussions about a return to MSNBC, where he emerged as a fiery left-of-center voice during George W. Bush's presidency. Regardless of where he works next, Olbermann told Simmons that he will do "something" between now and the end of the campaign. He expects the general election to be "twice as entertaining" as a primary season that has been dominated by Donald Trump. "There's plenty of time," Olbermann said. "I don't think there's anything close. ... I'm going to do it one way or another, even if I'm just writing, I'm going to be doing something the rest of the way." Olbermann has been weighing in lately on the 2016 race. He recently moved out of one of Trump's buildings in Manhattan as a protest against the Republican presidential frontrunner, harkening back to his Bush-era commentaries. Related: What should Keith Olbermann do next? It was Olbermann's second recent major interview, following his appearance last week on "The View." But the Simmons podcast was an unexpected venue, given the public displays of animosity between the two former ESPN personalities. In 2010, Olbermann said that Simmons had become "the most uncontrollable, unmanageable talent in the history of ESPN," after Simmons had issued a scathing assessment of his rival. "You're my worst case scenario for my career in 12 yrs," Simmons tweeted at Olbermann, "a pious, unlikable blowhard who lives alone." On Wednesday, Simmons likened Olbermann's appearance on the podcast to "raining frogs." Olbermann said he was just as surprised by the setting. But there were no awkward silences during the hour-long interview. The two men bonded over their rocky tenures at ESPN. And Olbermann was true to form, delivering characteristically long-winded responses on politics, baseball and media. When Simmons asked whether political satire can work in such a polarized environment, Olbermann gave a five-minute response on the futility of "compromise," an answer that included references to the Civil War, the Great Depression and Pearl Harbor. 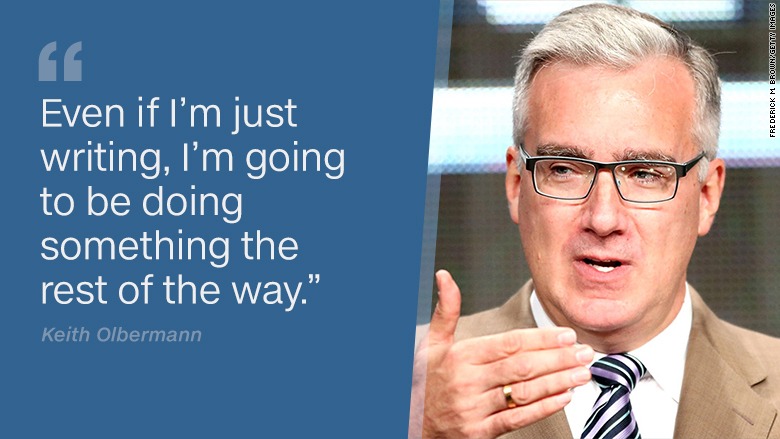 "We don't have a middle way at this point," Olbermann said. "Nothing that has been tried has been effective."